The Gnoming Librarian: Why Not Me? 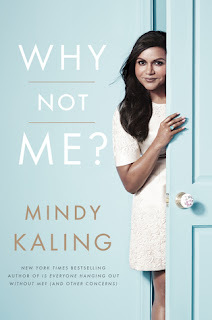 In Why Not Me?, Ealing shares her ongoing journey to find contemned and excitement in her adult life, whether it's falling in love at work, seeking new friendships in lonely places, attempting to be the first person in history to lose weight without any behavior modification whatsoever, or most important, believing that you have a place in Hollywood when you're constantly reminded that no one looks like you. I've deemed this my last memoir of the year. Two Mindy Kaling books, an Amy Poehler, Cary Elwes, and Felicia Day seems enough for a twelve month period. But I'm really glad I read both of Kaling's books close together. The Mindy of 2015 is much changed from the Mindy of 2011. Why Not Me? is insightful, sincere, and, of course, hilarious.You can definitely see the way Mindy has settled into fame and adulthood. She talks beauty secrets, office romances, and crash diets, but the cool thing about this lady is that she's comfortable in her own skin, which isn't an easy feat for any woman. I can only imagine that struggle is multiplied when you're in the public eye. As a thirty-something, she's a workaholic, awkward at times, and appreciates the importance of solid friendships. And that's where I find the connection with this sassy lady. She doesn't fit a stereotype and she has carved out her own career with determination and A LOT of handwork. She's driven and fierce, and while I can't quite understand her love for getting naked on set, Mindy Kaling is someone I would want in my corner. It's her humility and appreciation for the mentors and friends who have helped her along the way that is remarkable. And then she makes you laugh, and you realize that television needs more wacky, authentic, creative minds making shows. The essays are more cohesive this time around (with the exception of the rather long section where she discusses what her life would have been like had she become a Latin teacher.) And of course, if you grab the audiobook, you get to hear Kaling narrate the entire thing. A note on audiobooks. When you have two going at the same time (one on your phone and another in your car), play them at the same speed. I was listening to Felicia Day's You're Never Weird On the Internet on my phone at a super sped up rate, but when I got to my car (where speeding up the discs was not an option) it felt like Kaling was reading at a snail's pace. Took me forever to get through despite the fact that I was enjoying it :) Lesson learned. If you're a fan of comedic essays and memoirs, this is a great read.